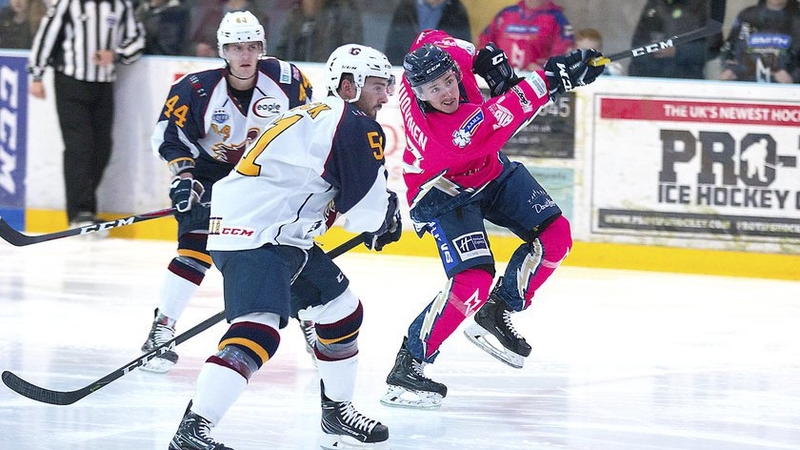 The Smith Recycling Milton Keynes Lightning suffered back-to-back defeats for the first time this season, losing 8-2 at home to the Guildford Flames. The Lightning were without Martin Mazanec (suspension), Nelson Armstrong (visa) and Owen Griffiths (injured) once again with James Griffin also absent. To help fill the void, the Lightning called up forward Josh Martin from the Bracknell Bees and had Latvian defenceman Rihards Grigors on a try-out. The home side, sporting their pink alternate jerseys for the Challenge Cup clash, started the game on the front foot with Joonas Huovinen getting an early wrist shot in on goal. But the impressive early start was cut short when the Flames took the lead after Ian Watters tipped the puck over goaltender Patrick Killeen’s shoulder. The Lightning fought back, but it took them seven minutes to pull level, with Tim Wallace tapping in an Eric Neiley pass into the Flames’ net – his first goal since joining the Lightning this off-season. Shortly after Wallace’s goal, the Lightning were left short-handed when David Norris was sent to the penalty box for a two-minute hooking penalty. The home side killed the penalty, returning to full strength, but the Flames were starting to take the upper hand in the game – taking the lead once again just under four minutes later, with Kruise Reddick getting his first goal of the game. The Lightning were on the power-play with less than two minutes left in the first period thanks to an Evan Ritt delay of game penalty – with the American lifting the puck over the boards. Defenceman Clay Anderson pulled the home side level with a strong wrist shot goal 12 seconds before the end of the period. Four minutes into the second period the Flames took the lead once again, with Watters tapping in a goal received from a pass that crossed the front of the net, leaving Killeen vulnerable on his far side. The Flames would not lose the lead for the rest of the game, adding to their tally six minutes later through Ritt, after a scramble in front of the net allowed the American to tap in the loose puck. Wallace was then sent to the box 30 seconds later for a cross-checking minor, which allowed the visitors’ Reddick to add to his tally – scoring the powerplay goal with just 15 seconds left. This goal led to goaltender Killeen being pulled from the game in favour of Adam Goss, getting his first taste of competitive action this season. The change did little to help, however, and the Flames scored another three goals across the second and third periods, seeing Watters earn his fourth goal of the night to close out the game with 13 minutes left. The Lightning fought hard throughout but were unable to get past Travis Fullerton and slipped to their second heavy defeat in a row, having dropped a 9-1 score in last Sunday’s away trip to Cardiff. 35-year-old Lannon is the oldest player on Doug McKay’s team and has a number of years’ experience as a coach. With the Lightning team sporting a number of younger players and first-time pros, his leadership and experience is valuable to the team. The Lightning now travel to face the Coventry Blaze in Elite League action tonight, Sunday 23rd September, and will be hoping to bring two points back to Milton Keynes with them.